The market for CRM lead management applications continues to grow, evolve and mature. 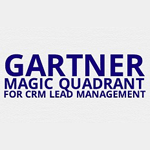 To keep track of it, Gartner has recently released its regular Magic Quadrant for CRM Lead Management. This Magic Quadrant evaluates 17 providers to help IT leaders find the right choice for their company, in collaboration with marketing, sales and digital commerce leaders. 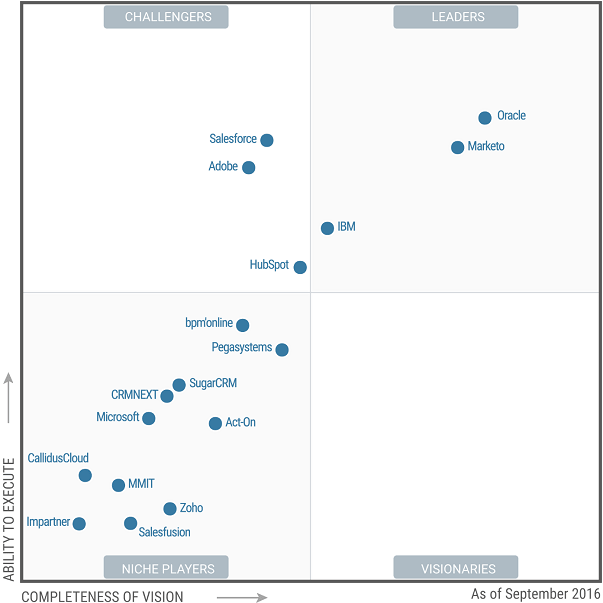 SugarCRM was among the best CRM vendors to be included in the Quadrant. CRM lead management integrates business process and technology to close the loop between marketing and sales channels, and to drive higher-value opportunities through improved demand creation, execution and opportunity management. A CRM lead management product can be delivered as a stand-alone technology offering. Alternatively, a set of lead management functions can form part of a broader CRM, sales force automation (SFA), multichannel campaign management, integrated marketing management, marketing resource management or email marketing application. Offerings can be provided as multitenant SaaS, single-tenant SaaS or on-premises applications. SugarCRM was named a Niche Player, based on Gartner’s assessment of the lead management functionality that is a core component of its CRM offering. For those of you who want to implement or enhance your lead management capabilities we’ve developed a handy SugarCRM extension called Check List. With its help, you can share and manage best practices like never before. Most of SugarCRM’s customers use some of its lead management capabilities. SugarCRM issues one or two major releases per year; the current version is Sugar 7.7. The company’s headquarters is in Cupertino, California, U.S. Flexibility: SugarCRM offers three different editions (Professional, Enterprise and Ultimate) and three different deployment models for each edition: SaaS, on-premises and hosted. SugarCRM’s software is based on the open-source LAMP stack. Value: SugarCRM offers a competitive price with a simple per-user, per-month model, which makes it suitable for companies that require a low-cost solution. In addition, reference customers gave SugarCRM above-average scores for its sales and contract negotiation process. Growth and improved delivery network: SugarCRM has achieved consistent year-over-year growth in revenue and customers. It has expanded its implementation capabilities through partnerships with solution integrators including IBM, Infosys and Wipro.